Auckland Mama Market is Auckland's exciting boutique market for families with babies and young children and this is our Big Xmas market. 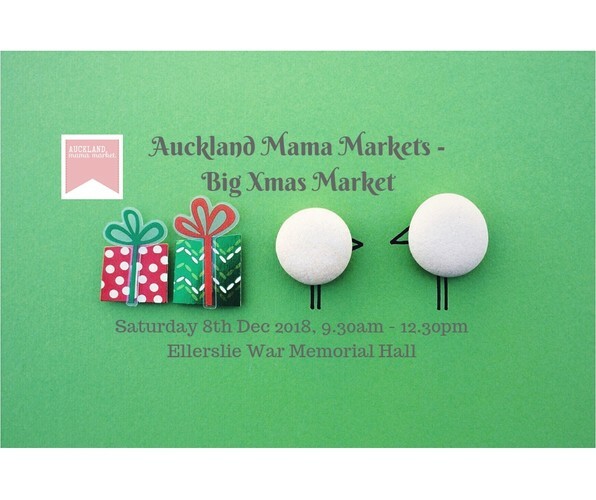 With a fabulous range of 40 stalls inside and outside the Ellerslie War Memorial Hall offering more great idea's for Xmas and day to day living with babies and young children, music and a kids entertainer popping in to say hi between 10am - 11.30am our last market of the year is going to be a good one! Much of what is sold at our markets is made by the stallholders themselves or is carefully selected by them for inclusion in their product ranges. Look forward to finding for babies and young kids a wide range of handmade gorgeous clothing, booties for little feet, bibs, blankets, a winter stock clearance of knitwear, teething jewellery and rattles, reusable cloth nappies and wet bags, dolls clothing and wooden toys and puzzles PLUS bow collars and harnesses for your furry friends, beautiful handmade advent calendars, Xmas stockings, and Xmas tree skirts, pillow slips for kids, stunning ceramic homewares and a lot more! Entry is free, there is parking behind the hall and in the surrounding streets and cash out facilities are available.